Job Offers & Business Opps. WIN! WIN! WIN! 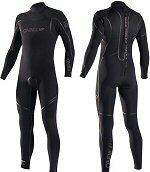 A pair of O'Neill 5mm Sector wetsuits worth £398! Both you and your buddy could soon be enjoying the warmth and low-bulk flexibility of an O'Neill 5mm Sector wetsuit if you enter our latest competition. Featuring triple-glued and blind-stitched construction, minimal seam design, 100% Ultraflex DS neoprene, Exterior Fluid Seam Weld and Firewall Insulation, the Sector is a fine example of the technical quality achieved by America's original wetsuit manufacturer, O'Neill. All you have to do for a chance to win is enter the competition in our free Divernet Xtra newsletter! Get a whole year's Digital Subscription for just £18!! Our new digital subscription service gives you instant access to your copy of Diver online each month, no waiting for the post, simply login to your account and select the copy of the magazine you wish to view. Don't forget to cast your vote in DIVER Magazine's latest Big Question for the chance to win a Luxfer emergency pony cylinder worth £106. This month we are asking: Do you think that tank sidemounting is the way ahead for diving? Answer yes or no, and feel free to comment. In the second part of a personal feature to accompany his current TV series on British diving, PAUL ROSE reveals the background to some of the most memorable episodes – and how the hard-worked film crew decided to get their own back on him! The 38th World Festival of Underwater Pictures returns to Marseille. The World Festival of Underwater Pictures will take place for the third successive year at the Palais du Pharo in Marseille, from 26 to 30 October 2011. FLASH - does it disturb the animals? Never call a dive rubbish! In the latest in his occasional series on diving celebs, Tim Ecott tracks down Hugh Fearnley-Whittingstall. The author and star of the River Cottage TV series is a passionate campaigner for sustainability, both above and below the water. Our selection of books on diving and related subjects can be sent to all destinations in the UK and abroad. WIN! An Oonasdivers Red Sea holiday this Week! Andark - PADI Advanced Openwater only £199, save £30! Andark PADI Openwater only £299, save £40! Package Holidays From £569 Per Person. We are now diving every day and will go out to local dive sites i.e. Kyarra, Fleur and Drifts for just 2 divers. Just send us an email to medina@madasafish.com to tell us what you would like to do and we will get you booked in or phone us 01929 423565 / 07977 142661. Our wide range of listings is designed to help you find everything you need to help you enjoy your diving. It lists all the businesses that will supply you with your diving needs, where to find them and what they offer - together with some great Special Offers and Last Minute opportunities.